Join photographer Jason P. Odell as he takes you behind the scenes for some of his favorite images. Travel along with Jason from Colorado to Florida and visit landscapes and wildlife through Dr. Odell's lens. Join photographer Jason P. Odell as he takes you behind the scenes for some of his favorite images. Travel along with Jason from Colorado to Florida and visit landscapes and wildlife through Dr. Odell's lens. While each image tells a story, you'll also get the behind the scenes details for each photograph, including location, tips and tricks, technical data and processing notes. With Field Notes, you'll not only learn about what went into each image, but also good advice about shooting outdoor locations. 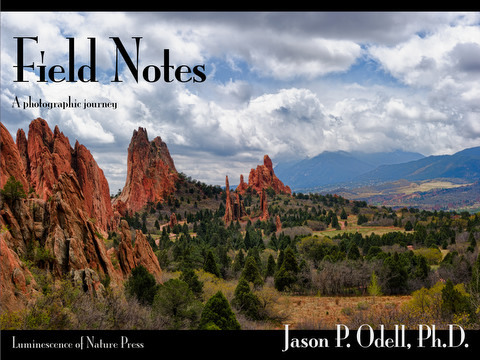 Field Notes is available via electronic download and is compatible with Mac, PC, and iPad. Users may print a copy for personal use if they so choose. Print versions are not available at this time.